The evening at the Bolshoi last night could not have been better. We walked from our hotel about two miles down the main avenue and reached the famous theater about a half hour early allowing us time to enjoy the warm evening and watch all the construction action on the plaza in front of the theater in preparation for the big day tomorrow—the 70th anniversary of VE Day. The ballet was “Don Quixote,” composed, and choreographed by Russians, premiering in 1867 at the Bolshoi. The program said this was “Don Quixote’s” 1,066th performance at the Bolshoi. I have never experienced a ballet like this one, and we have seen a lot of good ones in Washington. 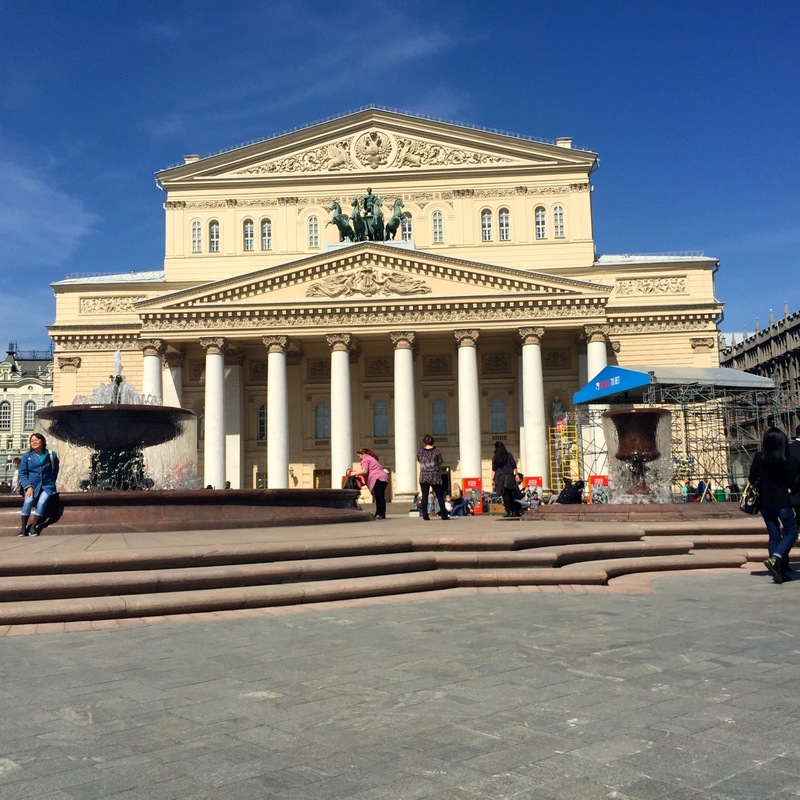 The Bolshoi is, quite simply, the best in the world. There is a fine line separating great from the very best, but you know it when you see it, and we saw it last night. Russians love their ballet . A packed house was standing, applauding and screaming “Bravo, bravo” for something like the twelfth curtain call when Embry and I started for the exit. What distinguished this audience from a Kennedy Center audience were the many families with children and the generally younger age of everyone present. I could not help thinking what extraordinary people these Russians are. They have produced the likes of Tolstoy, Dostoevsky, Chekov, Pushkin, Tchaikovsky, Prokofiev, Shostakovich just to name a few. They are among the word’s best poets, writers, composers, artists, scientists, and intellectuals. In Moscow more statues (it seems) honor artists and intellectuals than army generals. And thankfully there is not one statue of Stalin anywhere or any other communist leader except Lenin (at least that I have seen). You can’t help thinking how much we have in common with them and how we are all humans, just trying to live our short lives as best we can. Fast forward 12 hours. It is May 9, VE Day, marking the end of the European conflict in World War II and Russia’s victory over Germany in a war that cost the Russians 26 million lives. Described as the biggest Victory Parade ever, this parade has already shut down the city a couple of days ago for dress rehearsals. I was eager to see the festivities and made my way to the hotel lobby around 10:00 am, the time for parade to start. I was immediately blocked by a gruff policeman. 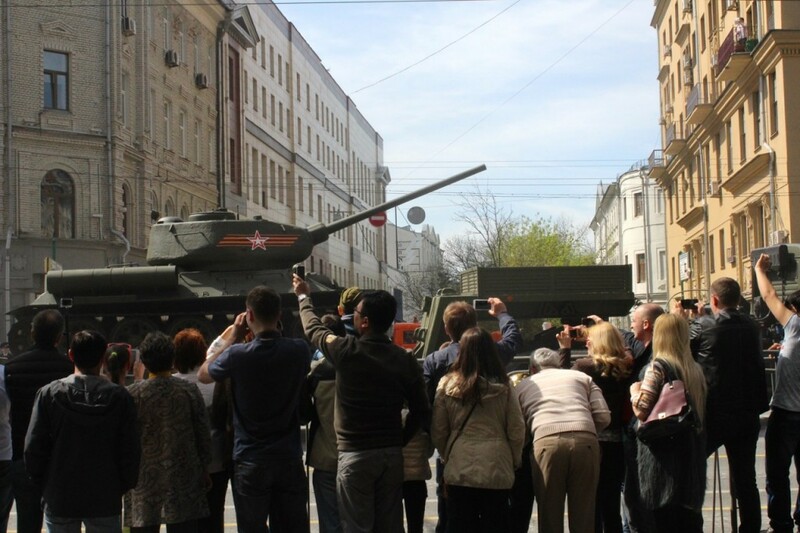 No one was allowed on streets except in front of the hotel where a few people were milling around with cameras though the main street was vacant except for police and armored vehicles parked along the side. 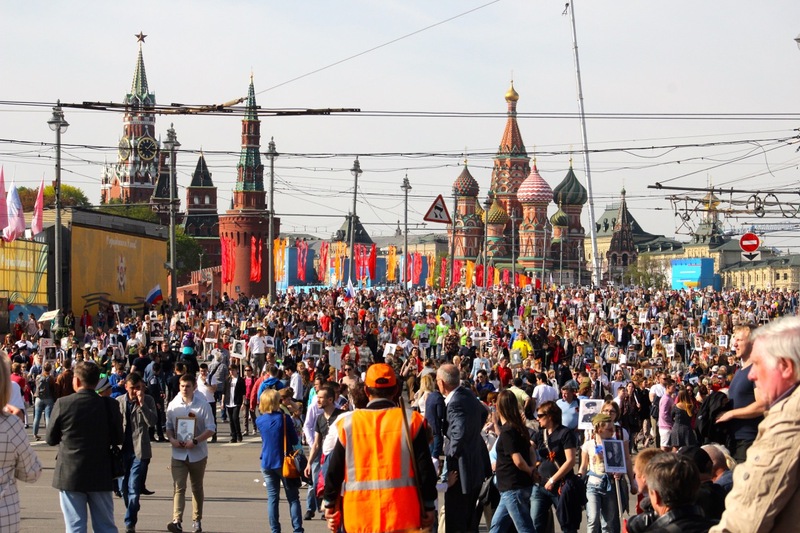 I returned to the hotel to find the lobby packed with people staring at a TV screen which was showing thousands of troops marching in Red Square. When Putin came to the podium, the room of several hundred people, almost all Russian, became eerily quiet, listening to every word. After the speech most rushed outside. Embry and I remained for a while for breakfast, but when we saw everyone looking up and snapping photos with cell phones, we rushed outside to join them. First there was a distant rumble, then seconds later a loud roar as a squadron of seven or eight fighter jets zoomed over at a low altitude. The crowd cheered wildly. Then another wave of jets and another and another. 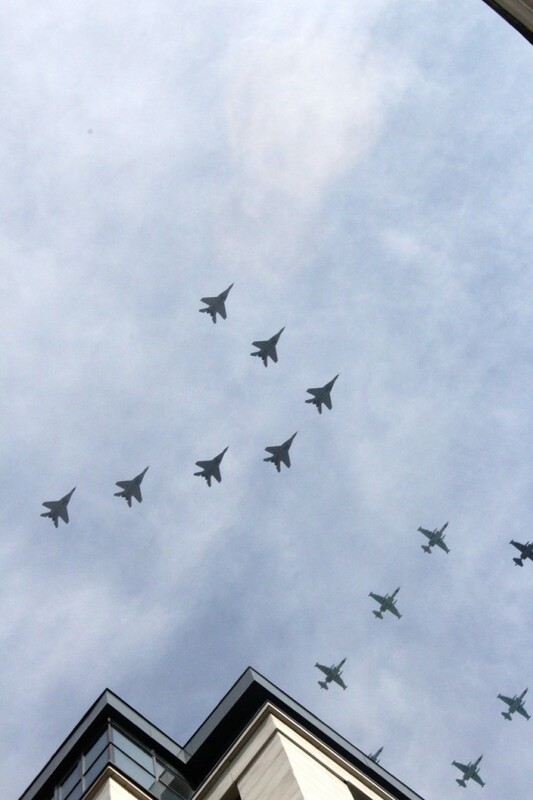 Each time a new group of airplanes passed over, people cheered and waved red, white and blue Russian flags. Eventually the planes quit and it was time for the tanks, troop carriers, and long range missile carriers. You could hear a rumble from the streets in the distance, then a slow prolonged roar almost as loud as the jets. They appeared one after another for what must have been at least thirty minutes: massive brown machines with guns and missile launchers of varying shapes. Every time a war machine passed us, the crowd, which was now packed along side the barriers, cheered loudly and waved their flags. Soldiers smiled and waved back. On the loudspeakers blared a song, perhaps the Russian Anthem. People sang along, some holding their hats over their hearts. I was still trying to figure out if I should be worried about all the guns, tanks and bombs when the big military machinery moved on and in the opposite direction came another parade, this one totally different—the parade of “common people.” The parade reached our hotel around 1:30 and at 5:00 pm it was still going about five miles away when we viewed it from our second hotel (where we are meeting up with our tour group for Siberia). In the early afternoon in front of the International Hotel the mood was boisterous and relaxed. All ages were represented. Almost everyone carried photographs of one or more relatives or loved ones lost in the war. 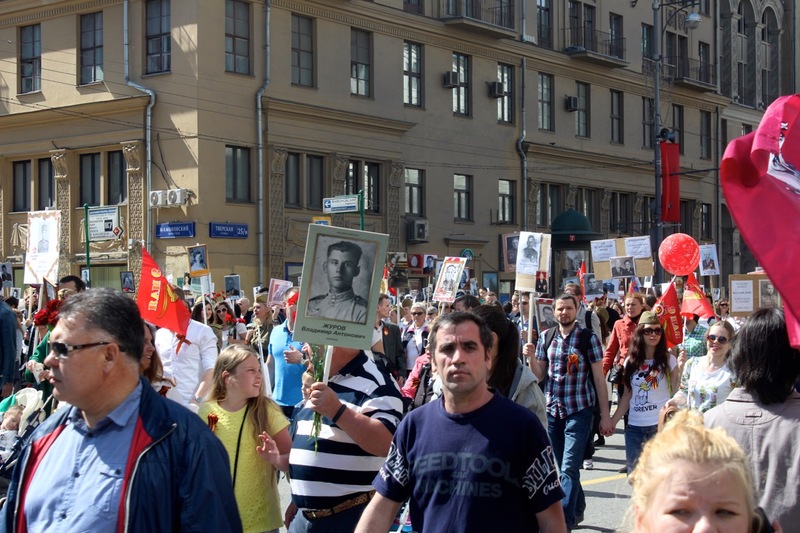 Many carried flowers and flags—some Russia, some former Soviet Union. Every so often the voice on the loudspeaker would say something and a huge , almost deafening roar would go out, like you would hear in Yankee Stadium when someone hit a grand slam home run to win the World Series. Four hours later when they reached our new hotel, they were worn out and exhausted, which figures because they had walked at least five miles and many of the walkers were quite old. No problem with that. The question for the day is what does “back” mean.” More on that to come. Mike, you make all the effort worthwhile. I am profoundly grateful. Joe, your story reminds us of our visit to Moscow a few years ago. We saw a Ballet but not the Bolshoi which we did see shortly after we were married in the 60s when they stopped in LA on a tour. VE Day sounded most exciting. Tout à fait d’accord avec Mike. Moi aussi je vois le vaste monde avec plus d’amour et de tolérance grâce à votre blog.